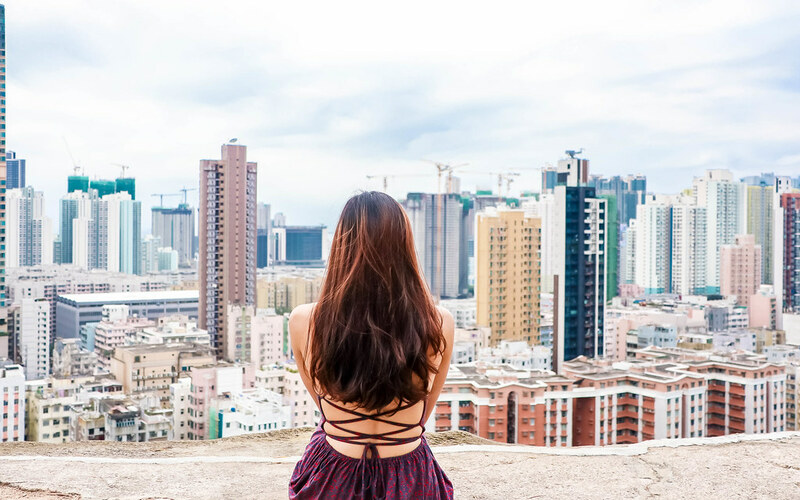 Just like how my hometown, Singapore, grew from a kampong (village) to the current 21st century cosmopolitan metropolis, Hong Kong has also developed from a small fishing village to a vibrant city full of skyscrapers. These high rise buildings are monuments to the modern age, acres of glass strung together with shiny steel. I love seeing the reflection of light which makes the streets seem incredibly brighter. 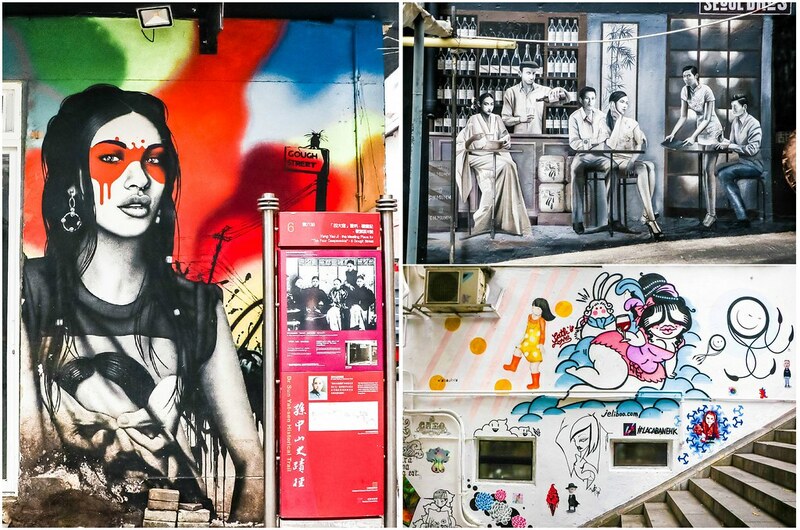 Doesn’t Hong Kong already sound like a great place for photography? 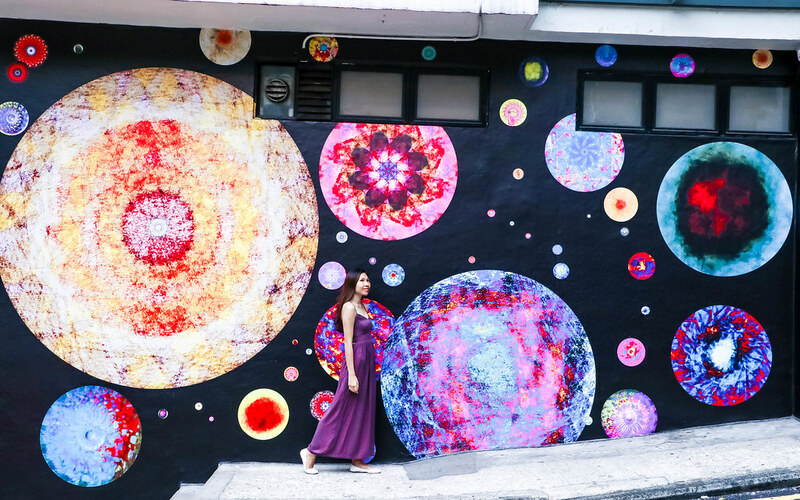 Whether you prefer joining the hordes of tourists at popular attractions or explore the unbeaten path, here are 7 spots in the city that will certainly draw more likes and comments to your photos! 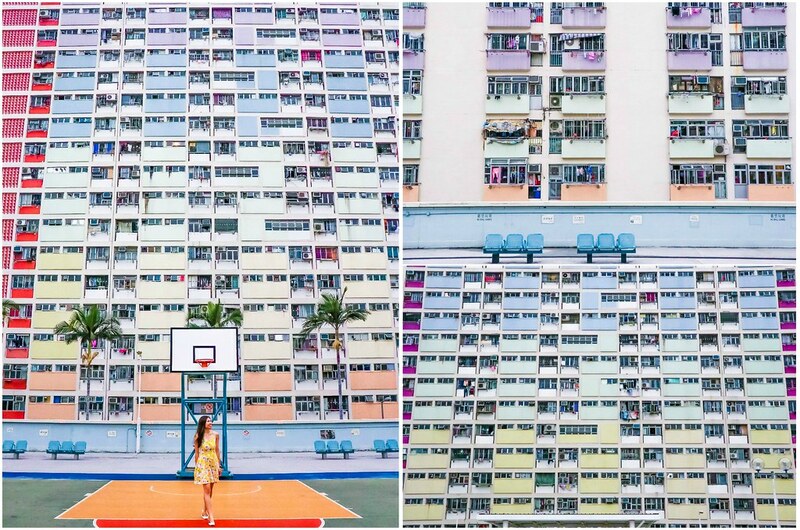 I read somewhere that the Choi Hung Estate was built in the 1960s, and given a splash of colours as a way to uplift the spirits of the residents. The best area for photos is located at the basketball courts on the carpark’s rooftop. I’m not sure how many residents are being housed in this estate, so be sure to respect the area as it is their home after all. Depending on the time of your visit, you may come across residents playing basketball or grandparents enjoying a lovely stroll with their grandchildren. 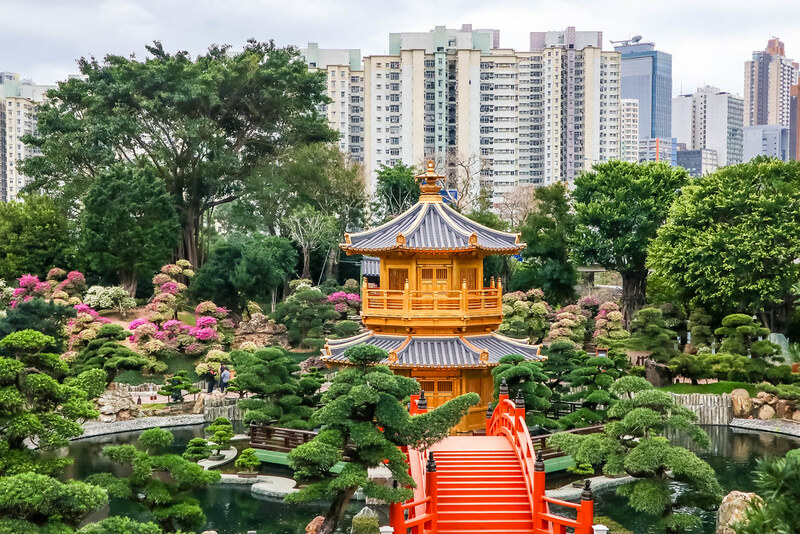 It’s pretty easy to get to the Choi Hung Estate by the MTR – alight at the Choi Hung station along the Kwun Tong line and take exits C3 or C4. 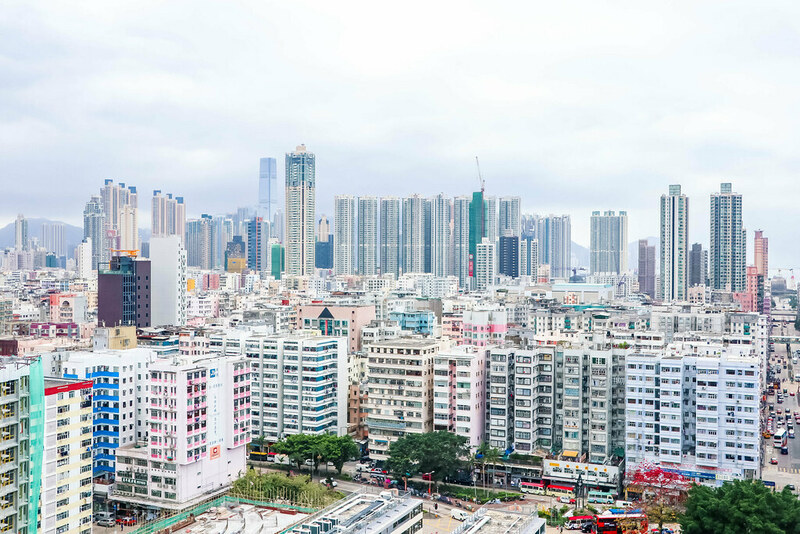 If you want to get a glimpse into how the locals live in Hong Kong, Sham Shui Po is the place to go. 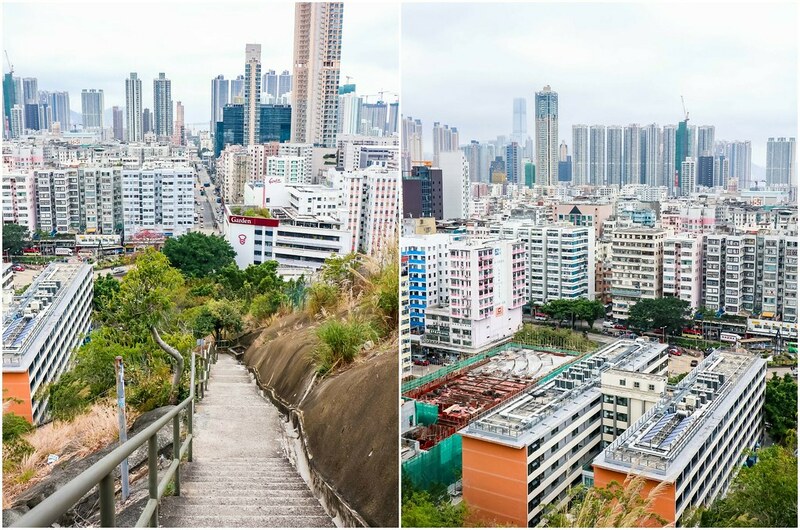 There is a Garden Hill where you can ascend the peak via climbing up many flights of stairs behind Mei Ho House which takes approximately 15 to 20 minutes. Public housing in Hong Kong first started here, so the panoramic view that you get at the peak is very different from the usual stylish towers. This is a hotspot for sunset, but I’ve been warned about the dangers of exploring the hill as a solo female traveller at night. Safety is of utmost importance so I decided to skip the sunset. You have to be very careful at the top because there is no railing at the so-called “observatory” which is just a simple platform. Alight at the Sham Shui Po station along the Tsuen Wan line and take exit D2. Head towards the Shek Kip Mei Estate and you will see Mei Ho House. 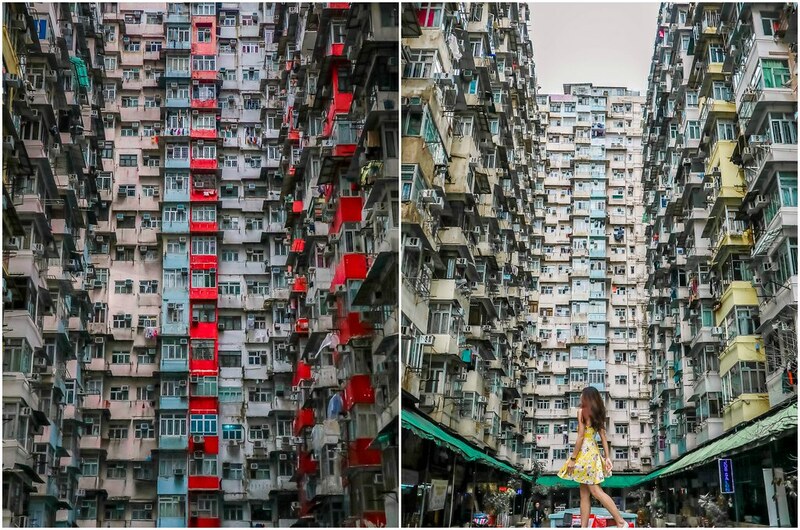 Hong Kong is famous for its densely packed neighbourhoods, and a good place to witness individual units stacked one on top of the other is at the Monster Building. This building is actually a huge complex comprising 5 connecting structures – Fook Cheong Building, Montane Mansion, Oceanic Mansion, Yick Cheong Building and Yick Fat Building. They were constructed in the 1960s to cater to low-income families. Due to its unique architecture, blockbuster movies such as the Ghost in the Shell and Transformers: Age of Extinction were filmed here. Alight at the Quarry Bay station along the Island line or the Tseung Kwan O line and take exit A. Walk along King’s Road towards Tai Koo. 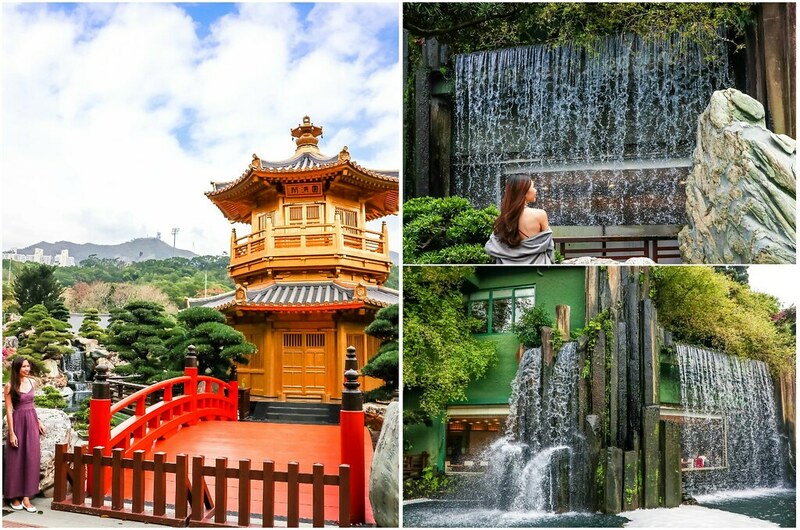 The Nan Lian Garden is an ideal escape from the urban hustle and bustle. 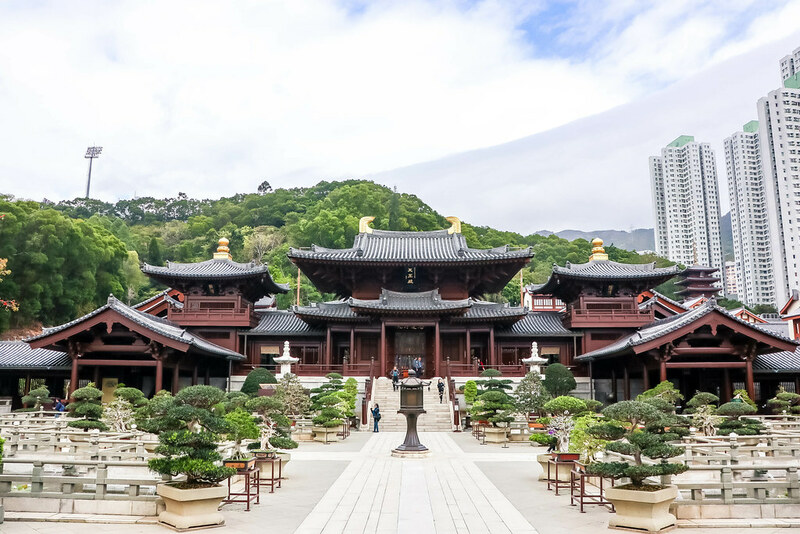 This classical garden in a modern city is connected to the Chi Lin Nunnery to its north, with a sprawling mountain range at its back. 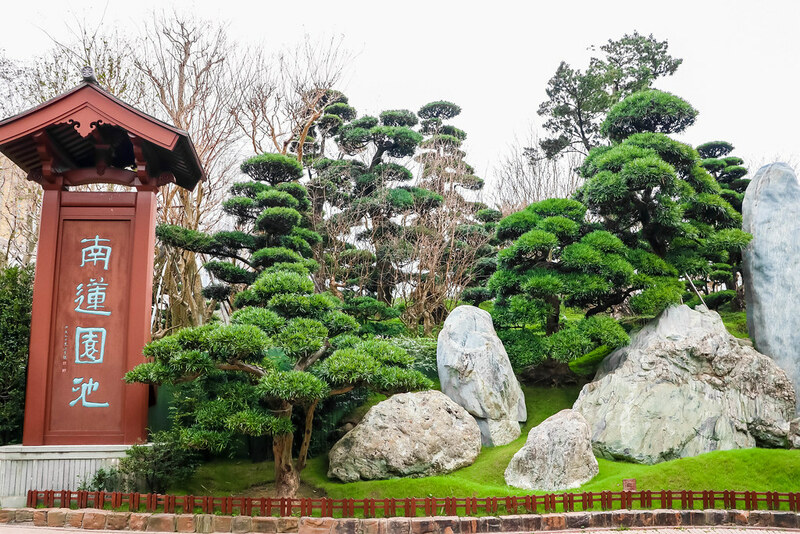 The design of this garden was based on Jiangshouju Garden of the Tang Dynasty, a traditional Chinese landscape garden in the Shanxi Province. The Pavilion of Absolute Perfection situated in the centre of the Lotus Pond is the most insta-worthy spot. Alight at the Diamond Hill station along the Kwun Tong line and take exit C2. There are many signs pointing you to the garden. 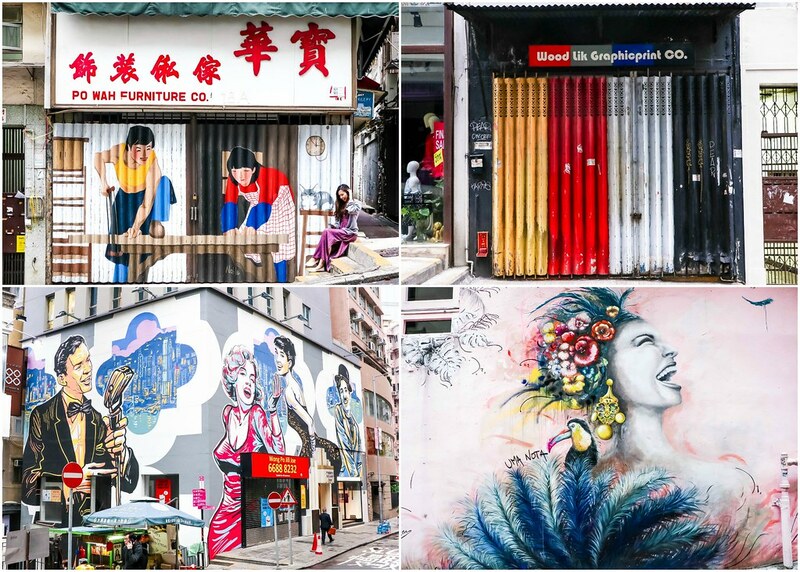 Street art, or to put it nicely, wall murals, are aplenty around the areas of Central and Sheung Wan. Instead of going on and on in words, I shall let the pictures do the talking. 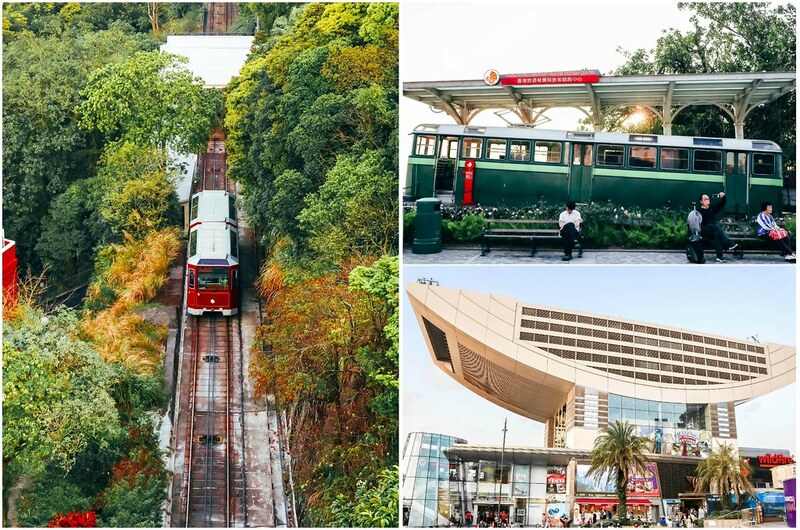 There are two things you should do at Victoria’s Peak. Firstly, take the antique Peak Tram – not up, but back down – because the queue for the peak tram up can get ridiculously long and you might end up wasting a lot of time just waiting in line. 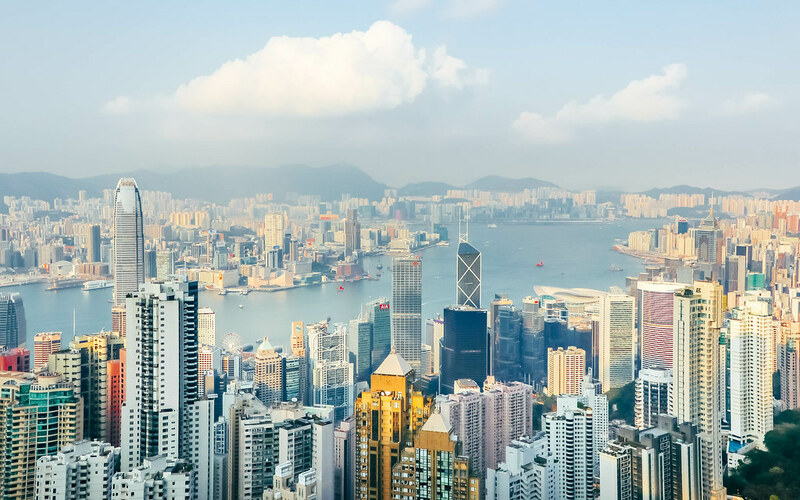 Secondly, as the name suggests, head to The Peak, the highest point on Hong Kong Island for a spectacular bird’s eye view of the city. 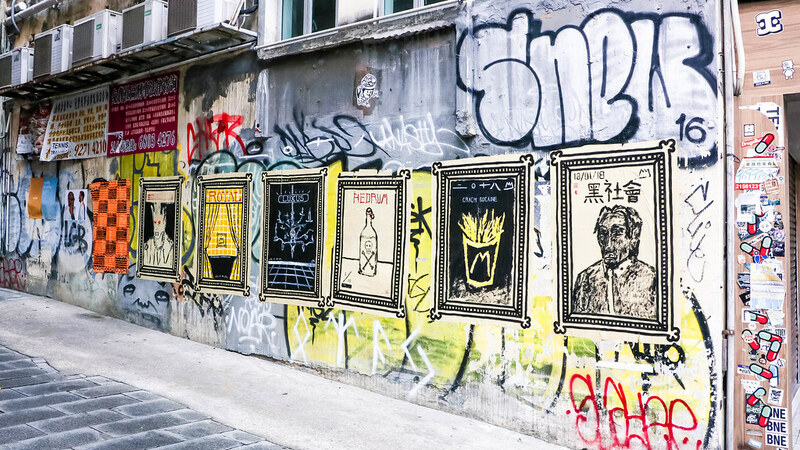 This area has been the city’s most exclusive neighbourhood since colonial times. If you have time to spare, stay for the sunset and watch the city light up beautifully at night. Alight at the Central station and take exit J2 to take the Peak Tram from the peak tram lower terminus on Garden road. You should just take a taxi up and experience the tram ride down afterwards. 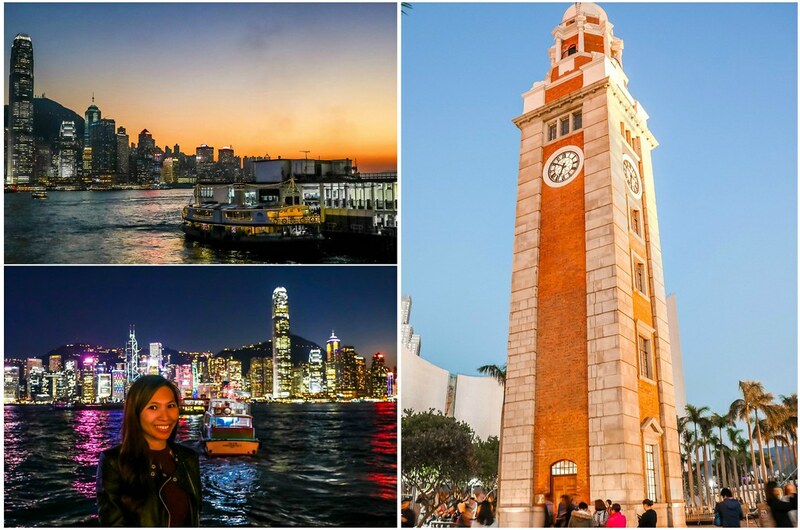 I went to the observation platform at Tsim Sha Tsui where the old Clock Tower is standing. 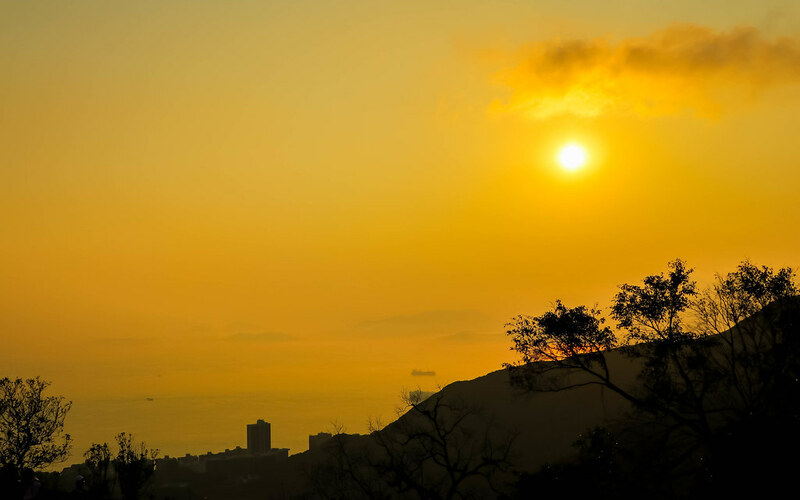 You get a splendid sunset view here while the buildings gradually illuminate in all sorts of colours. The colours are reflected on the water which makes almost every photo taken here perfect. 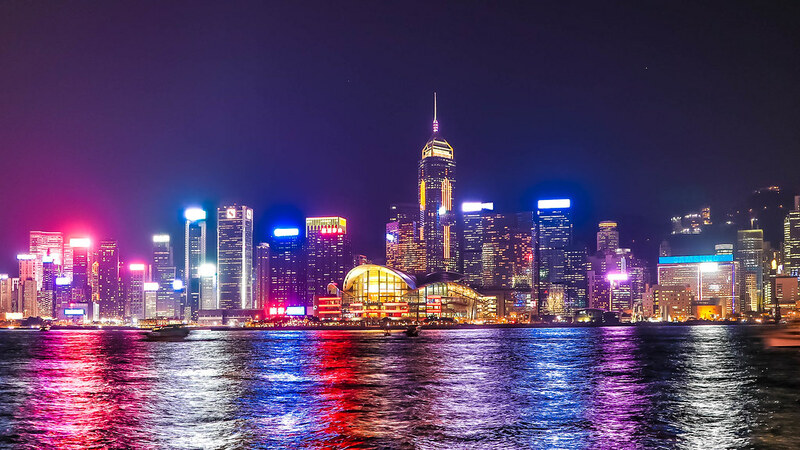 You can either alight at the Tsim Sha Tsui station, take exit L6 and walk towards the Clock Tower along Salisbury Road or alight at the Hong Kong station, take exit A2 and walk to the pier along Man Yiu Street. You can also alight at Central station, take exit A and walk to the pier along Man Yiu Street. 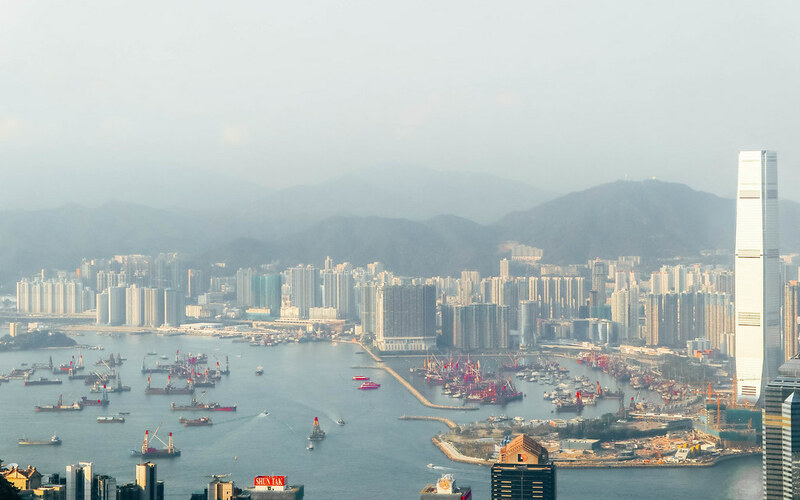 The last alternative is to alight at Wan Chai station, take exit A1 and take the skybridge to the Hong Kong Convention and Exhibition Centre, and descend to the Convention Avenue at Harbour Road. 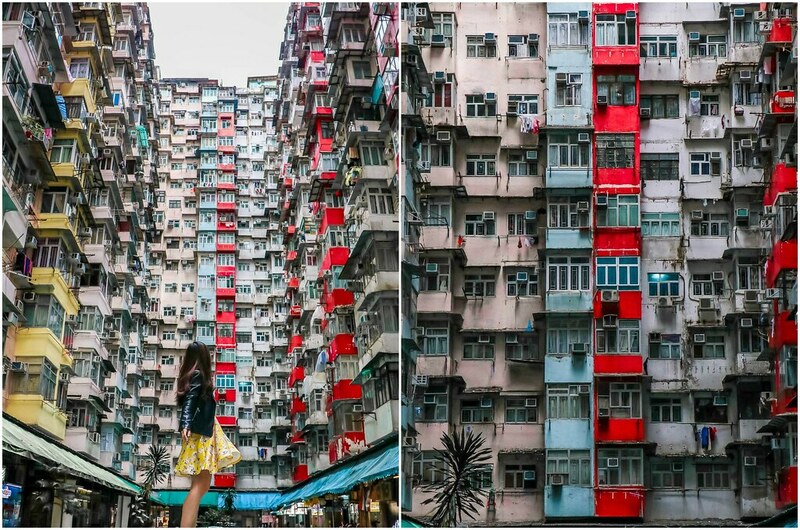 I’m quite certain that these 7 instagrammable places will keep your Instagram busy for the next month, or so. Below is a 60 seconds video to show you snippets of my Hong Kong trip! Hope you will enjoy! Greetings from Florida! I’m bored to death at work so I decided to check out your site on my iphone during lunch break. I enjoy the info you provide here and can’t wait to take a look when I get home. I’m surprised at how fast your blog loaded on my cell phone .. I’m not even using WIFI, just 3G .. Anyways, excellent site! Wow, thank you Jetta! You totally made my day! Great address and very great photos ! Hi Chris, thank you so much for your kind words! Enjoy Hong Kong!